After three and a half months on the road I’m happy to report that I’m back in Ho Chi Minh City. I left at the end of March this year to begin a trip that would take me around Asia, Europe, and North and Central America. This trip included meet ups with family and friends, a writing assignment in Europe, and a travel blogging conference in Toronto. After Canada and the US I travelled to Belize, which was my first time to Central America. I had flown into Belize with a grand plan of making my way through all seven countries of Central America. While part of that trip was intended to investigate places to live, I questioned if I was going just to tick off more countries on the places I’ve been list. After reading some online guides of things to do in Central America I realised that I don’t want to visit every Mayan ruin and see every little beach town, just for the sake of going. Instead, I picked out Caye Caulker in Belize and Lake Atitlan in Guatemala as places to linger on my trip (and at the rate I blog I will probably have a report on those places by the end of the year). That worked out to be a far more enjoyable experience than bouncing around from place to place on chicken buses. In Belize I spent my time in the Caribbean on the little island of Caye Caulker. I was planning to spend a week there, but after days of rain and a forecast of more to come, I cut my losses and left Belize earlier than planned. Crossing the border from Belize to Guatemala – with English making way to Spanish – I now felt like I was in Central America. If the Spanish didn’t give it away, the number plates gave me a little reminder as well. 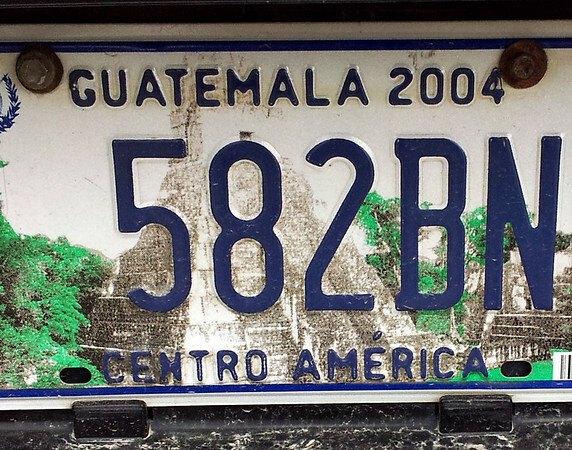 I arrived in Flores to see the Mayan archaeological site at Tikal, the national treasure that features on the number plate. Most of my time though was spent around Lake Atitlan, which is a popular place for digital nomads. The cost of living is comparable to Chiang Mai so I wanted to see what it would be like to live here. My original plan was to visit all seven countries of Central America in one go. When I wrote out an itinerary on paper I was exhausted just thinking abut it, so I pared it back to two countries. I was happy to stay put for a while and enjoy visiting two new countries, but I still tempted by nearby borders. I saw an advertisement for a minivan going to a beach destination in El Salvador and I immediately started calculating if I have the time. Then I came to my senses and reminded myself that I will explore the region around Atitlan. El Salvador and the other countries of Central America can wait. While I still would love to do that (Nicaragua calls out to me), at the moment I’m more in the mood to work in one place for a while. I was wondering if I had made the right decision to come back to Vietnam after having already spent five months of the last year here. The day I was returning I read Andrew Evans post on why he goes back to places he has already been. Not that I needed affirmation on my decision, but this article resonated with me at exactly the right time. I don’t like it when I hear that someone has “done a place” either, and at this point in my life I’m getting so much joy out of being in Vietnam. As soon as I set foot outside of the airport I knew I was back in the right place. I would rather be spending my time here than adding more countries to my visited list, just for the sake of visiting. I arrived here last year after a friend made the case for setting up in Saigon. A year later and this city is still a hotspot for location independent entrepreneurs. On my first day back I found a great room to rent for $230USD per month. This includes internet, and cleaning and laundry three days a week. I’ve been revisiting my favourite cafes and street food vendors, and getting friendly welcome back smiles at my most visited places. While I am renting a place here my travels will be one or two week trips rather than months on end. I will be doing some local travel, as well as making a trip to Hanoi. I would like to compare what it is like living in Vietnam’s two largest cities. Once my initial three month visa expires I will be back in Thailand for a month, where I’ll be attending a conference in Bangkok. After that I have a month to spare before I go back to Australia, which will be the first time in over a year. I love being in a place with great, cheap fruit! How do you deal with being in a place where every day, walking down the street, touts treat you like a tourist? As for the touts, they are only around the backpacker area of Pham Ngu Lau and Bui Vien, and then there they aren’t as bad I remember them to be when I first came here 8 years ago. Everywhere else in the city its like a normal non-touristy cuty. What a deal, $230 dollars for room, cleaning, and laundry! Annnnd a fruit stand on your doorstep!? Sounds like heaven to me. Glad to hear you are enjoying your time. I’m often caught in the battle of deciding to go to new places or back to places I really enjoyed. Like you, I don’t want to do the “check it off” type of traveling, but I do like seeing new places. Got to mix it up I suppose! Ahhh… Ho Chi Minh, how I miss thee! It’s funny that you went back there. I have been thinking of re-visiting Saigon to maybe stay for a few more months even though Regina and I originally agreed we would be in no rush to do so. It’s a lively city and I definitely miss those fresh fruit stands. Heck – the cheap rent alone is incredibly appealing at the moment. Looking forward to hearing more about your Central America ventures – as it too is in our “to live in” places. Thanks Konrad. I found that I kept missing it when I was away so it just seemed like a natural decision to come back. I don’t really want to travel just for the sake of ticking off places I have visited, so I am happy to be here. Any chance of settling down in Saigon? I got sticky feet in my first Asian destination, and haven’t regretted it for a moment (Taiwan, by the by). Well, actually I’ve regretted it on and off for the better part of a decade, but that’s part of being an expat. The frustration, especially once the newness wears off. To the dedicated travelers out there, how do you deal with the constant wear and tear of the different? Does culture shock ever get a chance to set in? You’d think after living a place as long as I have, I’d have it licked, but not so. Still little things amaze me and little things piss me off. Which is a roundabout way of asking, James, ever plan to stop somewhere? And just… stop? Hi Daniel, good question. My travels have certainly slowed down enough, to the point that I have spent half of the last year in HCMC. I am not one of those people who will proclaim that I am going to travel forever as you just don’t know in this long life. I might wake up tomorrow and want to stay some where. For now though I am happy with the current arrangement. I am still amazed by little things as well, down to the point that I am still grateful to be able to eat such good food on a daily basis. Little frustrations happens in any city so I don’t really equate that with a living abroad problem. I just travelled through Central America and changed my plans to see fewer places as there’s way too much to ‘tick off’. Glad you went to Lake Atitlan as it was a highlight and Guatemala in general for me. glad to have stumbled into this blog….enjoying the articles!